Indian cashew recipes. Cashews are a part of the nut family which are slightly sweet and buttery in taste. They grow in a tropical environment and are a result of labor intensive work. Cashews grow on a tree in a long, green kidney shaped pods that hang from branches. They are not sold in their outer casing because the cover of cashews is supposed to be toxic and resulting in rashes. The process of peeling, removing, roasting of cashew nuts is done by hand and also due to their perishable nature, they are one of the most expensive nuts. The advantage of cashews is that it can be used in an array of different recipes all over the world. Even though a little on the sweeter side, they are used in both sweet AND savory recipes around the world, especially in India, whether it's in gravies, snacks or desserts. Cashews have been used in Indian, mostly Punjabi and Mughlai cuisine, since many decades. Addition of a paste of these wonder nuts to food gives them a rich mouth feel and a proper consistency. It is one of the main ingredients in the Basic Makhani Gravy or any other Punjabi gravy like Dum Aloo. Not only is the usage limited to subzis, you can also add it to dals like Mixed Dal with Spinach to give it a better consistency. Cashew pieces are also added Dal dhokli! Whole or broken cashews form an important part of rice preparations as well. Along with raisins, they form a major component in Pulaos like Shahi Pulao and also different types of pulaos. In the south, cashews or peanuts are also added to Bisi Bele Bhaat to give it a crunch. Kaju and Coconut is added to Shahjahani Khichdi to give it more flavor and volume. Firstly, raw cashews form a snack in themselves and don’t need anything else! Secondly, they can be roasted as is or make Roasted cashews with different masalas. Cashews that are fried are usually added to many Gujarati and Maharashtrian jar snacks like Chivda or fried poha. In such jar snacks, they add not only to the texture of the whole thing but also to the overall taste. Cashews are a popular choice for adding to marinades as well. Generally a cashew paste is added to the marinades but sometimes it can be used as a main ingredient in it as well. Afghani paneer flavors cashew paste with masalas and marinates the paneer in that itself without adding any curd. Hara Bhara Kebab has cashews fixed over the kebab before the frying to add that extra crunch or added to the mixture itself like in Dahi Kebab. Kaju is an integral part of dessert making in Indian Cuisine. Not only cashews but also other dry fruits are used extensively as well. Whether as a garnish over Sheeras or as whole pieces added to a kheer called Paal Payassam, they are a wonderful addition. The best part about cashews are that they are not overly sweet and balance out the sweetness in the food. Kaju Katli is the most famous sweet made with cashews where milk, cashew powder, ghee and sugar are combined together till thickened, cooled and cut into diamond shaped pieces. Dry fruits combined together with jaggery make a delicious Indian praline called Chikki. They are also used in many types of cakes and cookies all around the world, Butter Cookies with a Cashew Stuffing being my favorite! If you want to know more about the Uses of Cashew Nuts, then you can check out our article on that. 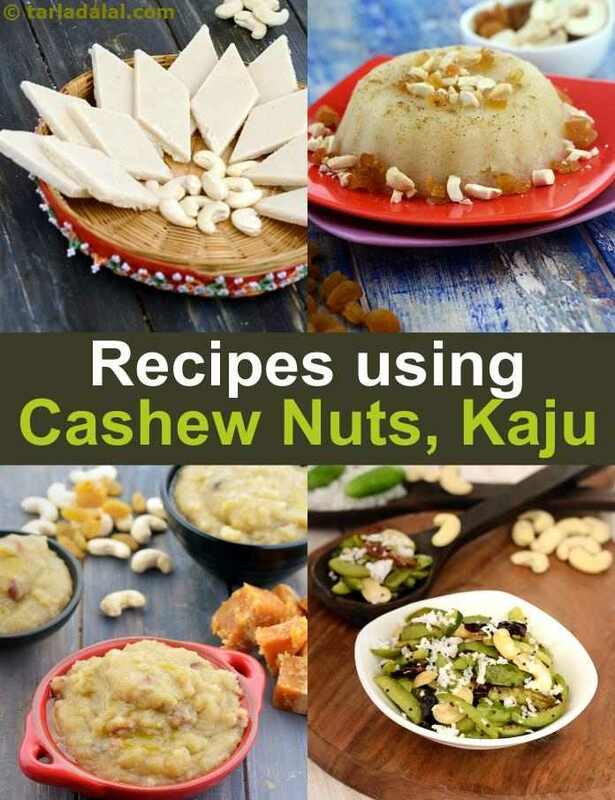 Hope you liked this collection of Cashew Recipes. Scroll down below for more. Yummy, crispy cheese and potato kofta in creamy red gravy. With a plethora of spices and a generous dose of milk, honey and cream, this is no ordinary gravy! A kerala-style preparation of bhindi, with an aromatic seasoning, and the added flavour of tomatoes and onions. Churned curds form the base for the dahi bhindi, giving it a tangy yet light mouth-feel. It goes great with puris.